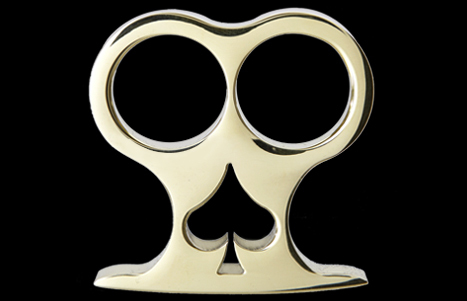 Original Design by underground weapon maker Mark R.
This special edition brass knuckles is hand cut and polished from a single piece of solid nautical brass. Everything made by designer Mark R. is released in very limited runs so hurry and order this model now or risk being disappointed forever! 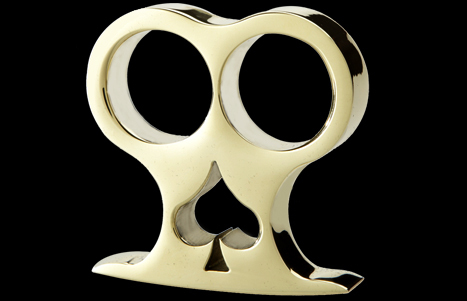 "All of my knuckles are made from 1/2" thick solid 360 USA made Nautical brass. I design, cut and finish all of the knuckles here in my shop. There are no cast or plated products. My pieces are cut on a CNC then hand finished. Use of the CNC allows large quantities of quality pieces but limits the detail capabilities because of the tool sizing. Therefore in order to make the more artistic designs I use a custom process which requires a considerable amount of hand work. Blanks for the customs are rough cut with a water-jet then the detail work is hand filed / sanded and all are polished. These are very labor intensive but there are no other knuckles available with the unique detail work." Don't miss your opportunity of own this authentic American made collectible today! Size: 2.38" x 2.38" x 0.50"